Up first on our list of Shows To See This Week is another great round of the weekly Bobby Floyd Showcase at Notes on Sunday, March 31st from 6 to 8pm. 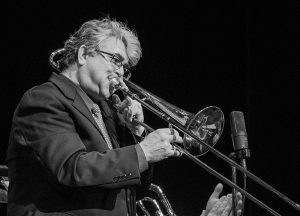 This week’s featured guest artist will be trombonist, OSU jazz faculty member, and Floyd’s Columbus Jazz Orchestra bandmate Jim Masters. The regular trio will also be in full form, with Floyd on piano and organ, Reggie Jackson on drums, and Derek DiCenzo on guitar and bass. I’m advised that this is a special occasion – wish Masters a Happy Birthday Sunday night! The event ends with the weekly jam session. Tickets and more info are available here – admission is free for musicians participating in the jam session, so grab your horn! Keep reading for previews of FLIPPO’s Herbie Hancock tribute and a masterclass by the visiting Huntertones! Friday, March 29th (9:30 – 11:30pm): FLIPPO: The Music of Herbie Hancock and the Headhunters at Natalie’s. Fresh off another round of Steely Dan magic at McConnell Arts Center, Columbus’ own fusion supergroup returns to Natalie’s with their celebration of the groundbreaking funky fusion of inimitable keyboardist Hancock. The band continues to present an all-star lineup of jazz talent, with Michael Cox on saxophones, Dennis Hodges on guitar, Erik Augis on keys, Andy Woodson on bass, Louis Tsamous on drums, Lucas Holmes on keyboards, and Zach Compston on percussion. Expect to hear Hancock tunes like “Hang Up Your Hang Ups,” “Butterfly,” and much more. Table seating has sold out as of press time, so grab your general admission tickets here now! Tuesday, April 2nd (6:30 – 7:30pm): Huntertones Masterclass at Jazz Academy at Lincoln Theatre. These world-traveling (they head to China and Japan in mid-April!) OSU alums return to their old stomping grounds for a SOLD OUT Jazz Arts Group show at the Lincoln on Friday the 5th. But earlier in the week, the band will stop by JAG’s Jazz Academy Tuesday for an intimate masterclass session. Expect a “discussion about their dynamic, innovative sound and their approach to developing original music and content.” This event is FREE, but space is limited – more details and free reservations are available here.